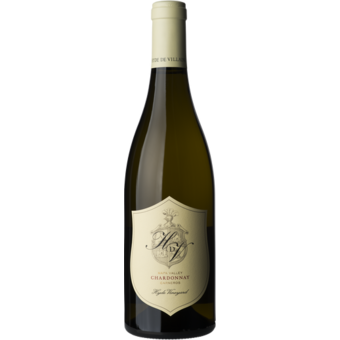 "HdV is a venture between the Hyde Family of Napa Valley and the de Villaine Family of Burgundy. The families, related by marriage, share long histories in French and Californian winemaking. In HdV, we have brought together our knowledge and experience for the purpose of creating single vineyard wines from the slopes of Hyde Vineyards. Entering our third year of drought, we were braced for another dry growing season and a need to be strategic with our water resources. Fortunately, generous late winter rain refreshed the vines in February just before bud break, and enabled rapid, healthy growth without human intervention. An unseasonably warm spring and steady, moderate summer sustained accelerated growth, ideal pollination, and early véraison in late June. Both clusters and berries were small—the marker of a great vintage. A string of cooler days and nights in August allowed the grapes to slow their ripening, and helped preserve fresh minerality and energy in the wine. Harvest began early in mid-August, then briefly paused due to the South Napa earthquake on August 24. We picked the last of the fruit on September 12.